i'm a recent university graduate and received my bachelor of physical and health education degree in june 2014. i'm a badassmatic [defined better by badassery than asthma] living with adhd and a learning disability. i'm into health advocacy, specifically asthma, blood and organ donation and exercise and chronic disease/adapted physical activity. i volunteer with the asthma society of canada. i choose to own chronic disease as i navigate my early-twenties "seeing life differently"--i believe perspective is crucial, positivity is essential and ignorance is curable, and that together, we can use the ripple effect to change people's thoughts and actions for the better. 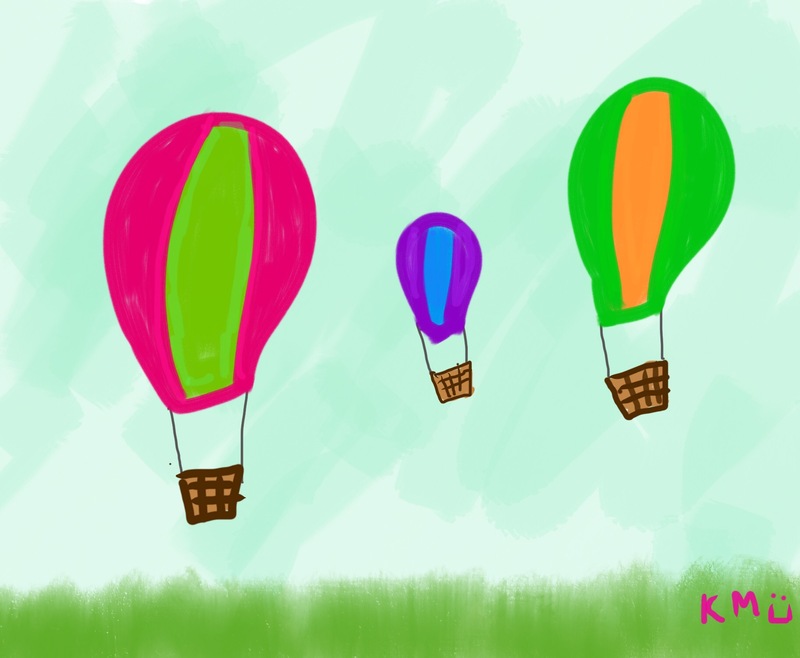 Hot air balloons. These looked less sideways-y when I was drawing them haha. Plank: maintaining at 85 seconds per the app! Meditation: 2:18 “a legal alien” on smiling mind. My blog has moved homes! You can find me at kerriontheprairies.com — oooh, shiny! To the awesome people who have put me in their blogrolls, thanks — sorry for being annoying and requiring a link change ;). This morning, Steve began a petition to help maintain funding for asthma research in the US. Click on the picture above to learn more and sign to help move this issue forward! There was a shooting in my area. It was rather far from home and I was at my grandparents’ at the time. There is no such thing as immunity to this. There is no immunity to hate, to fighting, to violence. Nobody is truly immune to this. And that’s scary. Scary that it hits so close to home, even if you have no idea who the people involved are. There were multiple victims. Yes, it was suspected that they’re involved in gang activity, and that’s unfortunate. Small choices lead to huge tragedies. But even if they were involved in gang activity, they’re still human. They’re brothers, sons, fathers, uncles, sisters, daughters, mothers, aunts. Friends. Now in critical condition because of one small choice leading to another leading to another. People still with a chance, a hope for redemption. Distant from home still feels too close. home — is this a quiet place where you should be alone? is this where the tortured and the troubled find their own? i don’t know. but i can tell this isn’t you, your cover’s blown. 12 of 12 – august ’11! On the 12th of each month, a bunch of bloggers from around the world take 12 pictures throughout the day. Here are my pictures for August 12th, 2011! 8:33 am – bathroom. This is my new digital peak flow/FEV1 meter, it’s pretty sweet. This thing basically shows how my silly asthmatic lungs are working at a given time. It’s fancy. See also — ziploc bags of junk I still haven’t unpacked from working at camp last week. 10:46 am – kitchen. Peanut butter and nutella sandwich. Yes, for serious. So yummy. It’s like a Reese’s peanut butter cup in sandwich form. 11:53 am – the bay. This makeup counter was playing really weird techno/poppy music about makeup. I was highly confused. I kind of wish I took a video. 12:05 pm – downtown. OH MY GOODNESS! IT IS BETHANY!! Bethany writes a blog called Me With D, and we discovered awhile back that not only do we have the same ophthalmologist [and the same pedi ophthalmologist back in the day] we’re fairly often in rather close proximity to one another. Anyway, it took several months but we finally met up on a 12 of 12 day! Bethany is awesome — our wander was so much fun. Except we kind of got distracted from taking pictures because of talking ;). 12:27 pm – downtown. Oldschool prison. Creepy, but awesome. 12:50 pm – lawn at school. Ran into my cousin, Dean, as I texted him when Bethany and I split and he was at the hotdog cart nearby. He is a nice cousin and bought me iced tea. 6:07 pm – kitchen. Dinner. So good. 7:55 pm – shooters. Mini-golf! My shoes are so match-y. 8:10 pm – shooters. HOLE IN ONE! 9:01 pm – perkins. Oh my goodness. I have wanted this sundae for so long, but I always ended up at Perkins for actual meals and was too full after for dessert. So awesome. 12 of 12 was created by Chad Darnell. Check out his blog to see a list of all August 12 of 12s. Thanks for allowing us to infiltrate your blog space for another year, Chad, and for dreaming up this great project! That was one of the questions we were asked in sociology this term. Last night, my friend Tara and I were talking about organ donation. Since I was in the eleventh grade, I have been a definite organ donation advocate. To me, it’s clear and it’s simple: if I die in a way that my organs can be donated to save someone’s life, then TAKE THEM. This discussion lead to Tara telling me that her boyfriend doesn’t share our views on the subject of organ donation. And I know I can’t change anybody’s mind, and I know that not everybody is going to share my stance on it. And in most situations, I can understand people’s apprehension behind some of the things I believe and agree with. And in regard to organ donation, I just can’t. Some people, I understand, it’s against their religion, and that’s fine, I respect that. But to just not want someone taking your organs to make them continue to be useful when you can’t use them anymore? I just think that’s stupid. A few years ago, a documentary was made in Vancouver called 65_RedRoses [in Canada, click here to watch]. It followed the story of Eva Markvoort, a young woman with Cystic Fibrosis as she awaited a double-lung transplant. Eva received her transplant. In following her transplant recovery and complications, the following quote always sticks out to me. I wasn’t here for six days, and I came back. Because people needed me. They wouldn’t be okay if I wasn’t here. She went on to continue be a huge advocate for transplant and the CF community in Canada which you can read about on her blog. Unfortunately, Eva’s lungs rejected and she died while waiting for a second transplant. Eva knew why she was here. She used every moment she had to love people. Some of us have stared death in the face. But the truth is, we’re all dying. What are you going to do to make this moment count? Feel free to tell me in the comments. and if i have to jump, then i’ll jump and i won’t look down. you can cry, you can fight, we can scream and shout. i’ll push and pull until your walls come down, and you understand, i’m gonna be around . . . i’m sticking with you. This is the girlie and one of her friends from her hometown, B. She’s a sweetie and has Down Syndrome, so like putting any two kids together, especially for such an extended amount of time, sometimes the girlie and B were absolute best friends like in the picture above, and others they can whine and squabble with each other constantly–more than is normal for a thirteen- and sixteen-year-old [B’s birthday was on Thursday while she was at camp, and she was graced by having a boys cabin sing to her]. And what can I say, they fought about girl stuff. There was a banquet on the last day of camp, which essentially meant we ate slightly fancier food for camp food, and that everybody got to sit wherever they wanted instead of just with their cabin groups, and that, oh yes, girls and boys could sit beside one another. Meaning, that the girlie and B and some other girls got very date-hungry and wanted boys to take them to the banquet [which, might I add, was an entire forty minutes long]. Because, yeah, they don’t take that. Anyway, later in the week, the guy got fed-up and exclaimed “Fine, I’m not going with anybody anymore”. And that was kind of the end of the fighting between B and the girlie for the most part. Thank goodness, sort of. So, yeah, B and the girlie were total teenage girls all this week, frustrating for me, but unavoidable. Somewhat like the girlie, B needs more support but not necessarily a one-on-one support worker. Meaning, I spent some time trying to help her and deal with her problems too. Fortunately, the girlie is very caring and was for the most part very okay with sharing me. While she can be difficult because of her ADHD and developmental delays, there are times where Jesus’ love shines through her in HUGE ways. Which will become evident in an upcoming post.